The Millennial Generation Sees the Inequality in our Government. – Direct Action Welfare Group Inc. The Millennial Generation Sees the Inequality in our Government. Millennials are more racially and ethnically diverse then prior generations. Millennials site jobs and unemployment as the most critical issues facing the country. Millennials are divide on whether attainment of the “American Dream” holds true today. Millennials see the need for economic reform to address the gap between the rich and the poor. 72% favor the “Buffet Rule” which calls for increasing the tax rates on people who make more then $1 million a year. 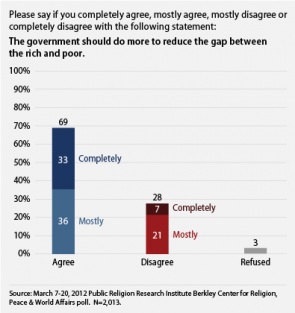 73% agree that the current system unfairly favors the rich. 76% say the jobs and unemployment are the most critical issues. 54% say education is the most critical issue facing the country. 61% say they are registered to vote but only 46% say the will definitely vote in the 2012 election. 57% self identify as white compared to 72% of the general population. 21% self identify as Hispanic, 14% as Black and 3% as two or more races. Pew Research Center describes Millennials as confident, liberal, self expressive, and open to change. They are less trusting and less skeptical then the previous generation. They believe that the government needs to do more to solve problems. They are tech savvy and are the most educated generation in modern times. They are less supportive than the prior generation of an assertive national security policy and more supportive of a progressive domestic social agenda. Millennials, often referred to as the Echo Baby Boom, make up a large percentage of the world’s population and thus have the potential to have a large impact on shaping society. This movement is me. It is my life. It is my daily breath. It may take my life, but it is my life.